Have you just googled “what are the best healthcare events UK”? If so, you need to look no further as the Care Roadshows healthcare events are among the most highly regarded and popular conventions for care home owners, managers and care professionals. With informative and inspiring seminars and exhibitions from leading industry professionals, all of which are entirely free of charge, you’re sure to regret not registering yourself for our upcoming convention on the 17th of April. If you are looking to achieve an outstanding level of care in your organisation, then you should inquire about the Care Roadshows healthcare events by registering today. You will be able to discover the latest products and innovative services while also benefiting from talks from recognised associations helping you to top up your CPD. Our innovative healthcare exhibitions host a wide variety of care suppliers who will showcase an extensive and varied range of the latest state-of-the-art products and services that will help you to support and develop your care related business. What really distinguishes the Care Roadshow from other healthcare exhibitions is that our well-established events are free for all care professionals. Our distinguishable healthcare conventions are run nationwide, so do not fret if you cannot attend the next upcoming event in Glasgow, as there are plenty more exhibitions running throughout 2018 for you to enjoy. In addition, all of our visitors are automatically entered into a prize draw for a £100 cash prize which will take place on the day. So, what are you waiting for? For the opportunity to expand upon your knowledge free of charge, you need to get in contact with our team today. We recommend that you subscribe to our newsletter to make sure that you never miss the announcement of upcoming dates for our healthcare events. You’ll be the first to find out about the latest Care Roadshow news as well as finding out when to book your early bird tickets – so it is advisable to give it a follow. Interested in speaking or exhibiting at any of our healthcare events in the UK? 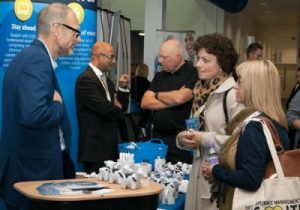 Care Roadshows are the ideal opportunity to engage face to face with your target audience, offering maximum exposure to collect high-quality leads and create exciting new business opportunities. To find out more about our standard and affiliate exhibitor packages or to register your interest in exhibiting or sponsorship, either contact us directly via email or by calling us. We are constantly looking for speakers to take part in our 30-minute educational seminars and interactive workshop programmes. If you think you would be able to provide visitors with some new innovative and inspiring ideas, then please do submit a proposal now and we’ll be in touch. If you have any questions about how to submit your proposal for speaking or exhibiting at any of our notable care conventions, then please do not hesitate to get in touch with our friendly and helpful team of professionals. Alternatively, you can have a look at our FAQ page to find the answers to the most frequently asked questions that we receive. Why should you visit Care roadshows healthcare events UK? There really are a number of reasons why a visit to our distinguished and well-regarded Care Roadshows would be incredibly rewarding for both you and your organisation. Not only can you be front and centre at some of the leading exhibitions in the industry as well as attending expertly run seminars, our conventions are completely free of charge to attend. So, you have nothing to lose and everything to gain by visiting any of our exhibitions up and down the country. For those of you who need more reassurance that visiting our healthcare convention could be extremely beneficial to you and your organisation, we recommend that you have a look at our glowing testimonials. After all, you don’t just have to take our word for it that we are among the best healthcare conventions in the UK. Listen to what our visitors, exhibitors and speakers have to say about Care Roadshows. It is clear to see that from both perspectives, whether you are a visitor or exhibitor, you can benefit significantly from our superb healthcare conventions. If you have read through all of the above and realised: “Care Roadshows healthcare events UK are exactly the type of care convention I was looking for,” then there are several ways that you can get in contact with our friendly team today. You can register your interest in our well-established and inspiring healthcare events UK by getting in touch via email at info@careroadshows.co.uk or by giving us a call on 01425 838 393. We’ll be more than happy to answer any queries or questions you may have as well as helping you to get book your free tickets by registering today.